If you have suffered injuries as a result of a slip or trip resulting in a fall on someone else’s property, you may be able to file a lawsuit to seek recovery for your medical expenses and other losses incurred as a result of the incident. 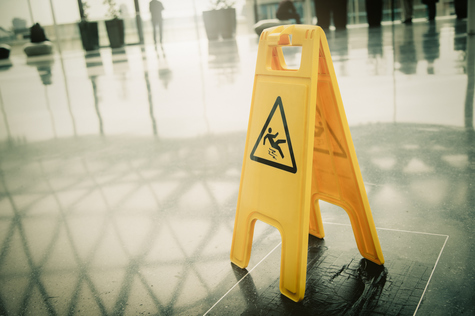 Slip and fall accidents are a type of premises liability claim. If the property owner negligently failed to properly maintain the premises in a reasonably safe condition, he could be held liable and legally responsible for your losses. However, it is important to note that we all are expected to be aware of our surroundings. Slip and fall lawsuits can be complex. Angotti & Straface Attorneys at Law offers a free initial consultation to determine whether your slip and fall injury was the fault of the owner of the property. How is Liability Determined in a Slip and Fall Injury Case? Various conditions apply when determining whether or not a property owner is liable for a slip and fall accident. Most importantly, there must have been a pre-existing dangerous condition that the property owner knew about, and which presented an unreasonable risk that you could not have anticipated. Each case is determined on an individual basis. If you were careful and paying attention to your surroundings and were injured through no fault of your own, you may be eligible to file a claim for compensation. In West Virginia, the statute of limitations to file your claim is two years from the date of the incident. Injured From a Slip, Trip, or Fall in Charleston or Huntington, WV? Many serious injuries, such as broken bones, brain injuries, and spinal damage may be caused when individuals slip on non-maintained surfaces, such as those left covered with snow and ice, uneven pavement, non-illuminated sidewalks, and other known dangerous conditions. If you have suffered a serious injury from a trip, slip, or fall, contact Angotti & Straface Attorneys at Law at: (304) 292-4381. We provide the compassionate and professional attention that your case deserves. We serve clients in Charleston, Huntington, Parkersburg, Morgantown, Wheeling, and throughout West Virginia.